The parking meter updates went into effect on April 15. 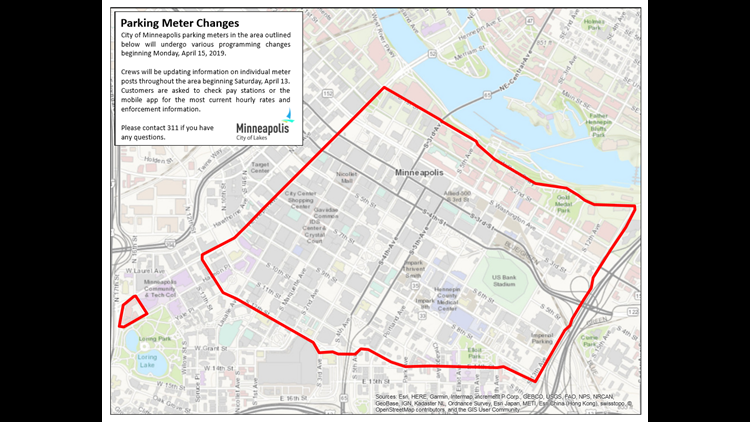 MINNEAPOLIS — Drivers looking to park in downtown Minneapolis should be aware of some new changes. On April 15, the city updated parking rates, enforcement hours and maximum parking times for a large section of downtown parking meters. Minneapolis City Parking System Manager Tim Drew says the big change is in Downtown Core Meters, going from $2 to $3 an hour. He says those rates haven't changed in 20 years. Also, keep an eye on time limits. Many spots have changed to 2-hour time limits. 2,626 parking spaces are impacted by some kind of change. According to a written statement from the city, downtown metered parking is intended for short-term parking, so time limits will obviously be reduced at some meters. People looking to park for longer periods of time should consider off-street options. Hourly rates, time limits and enforcement hours vary by space. The interactive Minneapolis Parking Meter Map can help you plan your trip downtown. For more details about downtown parking, visit minneapolismn.gov/parking or call 311. For a look at the city's interactive parking meter map, click here.